This article is for informational purposes only and is not intended as financial or legal advice. Women-owned businesses are on the rise. There are 11.3 million women-owned businesses in the United States, according to American Express’ 2016 State of Women-Owned Business Report - that’s about 38 percent of all businesses. Since 2007, the number of women-owned businesses increased by 45 percent, five times faster than the national average, according to the same report. Yet despite this growth and how much women-owned businesses contribute to the economy — they employ nearly 9 million people and generate over $1.6 trillion in revenues as of 2016, according to American Express’ report — it can still be difficult for women business owners and entrepreneurs to access capital. What problems do women business owners face when it comes to funding? Accessing capital is difficult for all small business owners. Twenty-seven percent of small businesses that apply for funding are denied or only partially funded, according to the Federal Reserve Banks’ 2016 Small Business Credit Survey, and 44 percent don’t even apply — whether it’s for fear of denial or because they are debt averse. But for women-owned businesses, data points to a lending gap. For example, women-owned businesses don’t get a proportionate share of loans. Women own about 38 percent of all businesses in the U.S., but only receive about 18 percent of small business loans, according to SBA Lending Statistics for Major Programs. And a study by Babson College found that businesses owned exclusively by men are four times as likely to receive venture capital funding. And despite the fact that women are starting businesses at a faster rate than men, only 5.5 percent of women use bank loans to start their businesses, compared to 11.4 percent of men, according to a report with the National Women’s Business Council. They start their business with half as much capital as men ($75,000 compared to $135,000), according to the same report. In some cases, it may be due to the same factors that affect all small business owners. Of business owners whose loan applications were denied or partially funded in the Fed’s 2016 Small Business Credit Survey, 31 percent had insufficient collateral, 29 percent had a low credit score, and 28 percent had insufficient credit history. Women may also be less likely to apply for funding. The Department of Commerce found that women are more likely to self-finance their businesses rather than access outside financing. Despite these statistics, there are women business owners out there getting funding every day. And we know that capital is important for growth — it’s what allows you to invest in new equipment, open a second location, and hire more employees. So if you want to access new capital for your business, you need to educate yourself about your options. Here we review two of them: small business loans and private grants. You might apply for a traditional small business loan through a bank. But getting a small business loan from a traditional bank can be tough for any small business owner, especially if you’re just starting out. Luckily, traditional banks aren’t the only avenue for small business owners to secure funding. Square Capital provides access to small business loans — the average size of a loan through Square Capital is $6,000. And the ability to repay as a percentage of daily card sales works with the cash-flow needs of small businesses; you pay more when you’re busy and less if things slow down. With Square Capital, the application process takes just a few clicks, and upon approval, funds can be deposited into a borrower’s bank account in as little as one business day. 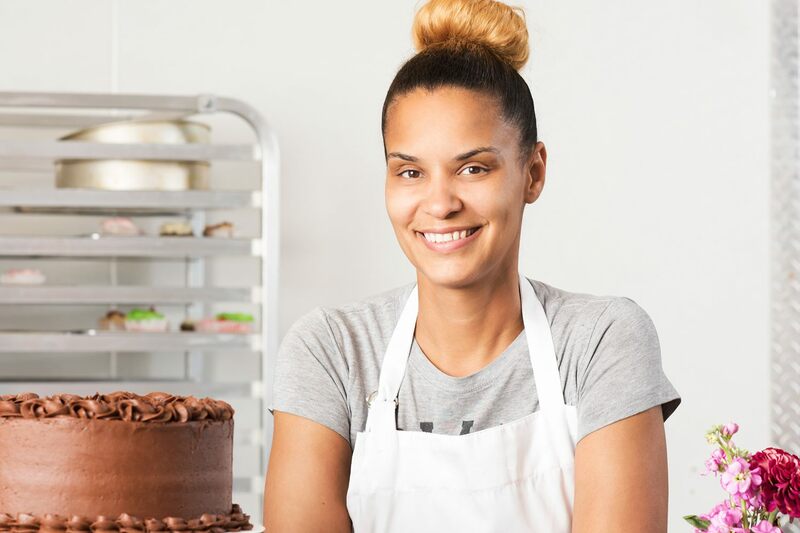 The 2017 survey also found that over 80 percent of women entrepreneurs who accepted funding through Square Capital indicated they were able to grow their business with the funds. Most used their loans to purchase inventory, purchase new equipment, and help fund day-to-day expenses. Unlike a loan, a grant is money that you don’t have to pay back. Sounds great, right? It is, but it’s also much more restrictive than most other funding options available to small business owners. Most grants come with strict guidelines as to who qualifies for funds and what those funds can be spent on. There are a number of grants out there for women-owned businesses. We’ve highlighted a small group of private grants here (there are also government-backed grants that you can find out about through the SBA). But if you are interested in this route, make sure to do your own research. There may be industry- or geographic-specific grants that you qualify for that aren’t included here. The jeweler awards 18 early-phase women entrepreneurs heading businesses that have significant growth potential in six global regions. Six first-place finalists receive $100,000 and personalized mentoring (all other finalists get $30,000). All the finalists benefit from coaching, workshops, and media exposure. The women’s clothing retailer awards $100,000 to up to 10 businesses that have at least 51 percent women ownership and leadership. To be eligible, your business must be at least three years old, have less than $1 million in annual revenue, and focus on environmental or social change. The Tory Burch Foundation awards a fellowship to 10 women who own a majority stake in a business and manage those businesses on a day-to-day basis. The fellowship includes a $10,000 grant and the opportunity to pitch industry leaders for a $100,000 grant. FedEx rewards $100,000 in grants to 10 small businesses ($25,000 to the first prize winner). To enter, they ask businesses to share how they got started, their philosophy and goals, and what a grant could help them accomplish. Part of the judging involves the general public voting for the finalists via social media. This grant program isn’t limited to women business owners. Backed by the SBA and the Sara Blakely Foundation, this challenge rewards women entrepreneurs who run businesses dedicated to providing products and services that impact women and families. Applicants are entered into a local contest first; winners of those local competitions move to the semifinals. From there, finalists present their businesses at a national competition hosted by the SBA. The winner could receive up to $70,000 in grant money. This organization provides grants for women-backed projects that promote gender, racial, and economic justice. To enter, you must be a woman and your business must benefit women and girls. The foundation provides grants of $2,000 and only considers applicants with no more than $75,000 in resources. This foundation awards $500 to a different women-owned business each month. At the end of each year, one of the 12 monthly winners is awarded an additional $2,000. To apply, explain what your business is and describe what you’d do with the grant money. Judges look for women with passion and a good story. Read the synopsis and guidelines. Be sure that you are eligible before you put time into applying. Keep organized by putting together a list of all the documents you need to submit with your proposal. Grant applications can be technical, so don’t be afraid to ask for help — especially if you’ve never written a proposal before. Organizations like the SBA and SCORE can provide coaching for grant applications. Review, review, review. Have a few people look over your application to ensure that you’re including all the appropriate documents. Sometimes, it’s nice to have a little guidance. While not all of these organizations provide funding, they can be invaluable resources for small business owners as they look to grow. There are a lot of organizations dedicated to helping women succeed as business owners and entrepreneurs. We’ve put together a handful that we think are useful, but it’s not exclusive. If you want an organization or group dedicated to your particular industry or focused in your hometown, do a little searching — you’ll probably find it. These SBA-sponsored centers are designed to help women entrepreneurs with business development and access to capital. There are almost 100 centers across the country. Some lend money directly, while others just help you find grants and loans that you may be eligible for. If you’re not close to a Women’s Business Center, check out an SBA Small Business Development Center. This dues-based organization represents the interests of women entrepreneurs across all industries. Members get access to events, e-learning, and a library of resources that includes topics like accessing capital. This is a nonpartisan organization that works to increase economic growth opportunities for women. Its areas of focus include access to capital, education, and political office. It also certifies women-owned businesses that want to be eligible for federal contracts. This group provides opportunities for women entrepreneurs to grow personally and professionally through ongoing education and networking. This is an organization that helps connect women entrepreneurs and angel investors. Even if this isn’t the road you want to go down, it has a great resources section that includes helpful tools and blogs. This nonprofit is the biggest network of volunteer business mentors in the U.S. An SBA partner, it provides free business counseling. It also provides low-cost seminars and online training. TED provides global conferences focused on “ideas worth spreading” — and videos of these talks are all available online. Great if you’re looking for some inspiration. Getting funding doesn’t have to be a headache. With improved access to capital, through online lending sources like Square Capital, grants, and sponsorships, women can knock their business goals out of the park. How Can You Invest More in Your Business? 1This online survey of 7,000 Square sellers who have accepted loans through Square Capital was commissioned by Square Capital and conducted by Qualtrics. The survey has an overall margin of error of 1–2% at 95% confidence interval. Participation in the survey was optional and all data was self-reported by study participants. Responses and insights gathered were shared with Square Capital in an aggregated and anonymous manner. Respondents participated in the study between January 9 and 11, 2017.